Part of our training on Types 13 & 14 was to become familiar with how they were used in a mobile form. The code word for a collection of mobile versions was 'Vast Convoy'. 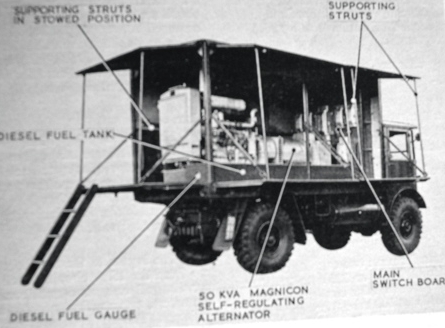 Such a convoy consisted of all the radar equipment being mounted on Leyland Hippo lorries, and a typical convoy consisted of a variety of radar 'heads', an Operations vehicle, a Wireless vehicle, a workshop vehicle and diesel generators. At Locking a selection of these vehicles was kept in the vicinity of the Bellman Hangar, a cavernous building which was situated near the Fitter's lines, and which obviously dated from before the war. Inside there were to be found three diesel-alternator sets mounted on low concrete plinths. The instructor in charge of these was a brown-overalled civilian and the several lessons we received from him were delivered in a rather relaxed manner. This picture to the left shows the generator set deployed for use. The Lister JP4 diesel engine was a four cylinder four stroke ohv affair with water cooling. The compression ratio was adjustable by hand-wheels which could introduce 'air cells', and was normally set to 19:1 for starting and low loads, 16:1 to be used under heavy load conditions. The engine normally ran at 1000 rpm and this produced a modest 38bhp. Fuel consumption was 1.3 gallons per hour and the fuel tank held 20 gallons. A centrifugal governor (Stephenson flying balls type)adjusted the fuel supply to control the speed when load variation made that necessary. The alternator this beast drove was capable of delivering 87 amps at 230v AC 50c/s., regulated. Or instead if required, two phases of 230v at 30amps each together with 400v 10amp three phase four wire, all unregulated. A switchboard equipped with a variety of hefty switches and meters was provided to select and monitor these outputs. The regulated output was controlled by an archaic but thoroughly reliable 'carbon pile' regulator. This consisted of about 15 carbon discs stacked vertically. These were held compressed by a 'torque motor' driven from the alternator's output. This carbon pile was in fact a series variable resistor in the exciter (field) circuit of the alternator. Hence a drop in alternator output due to increased load caused less compression on the pile resulting in increased resistance, in turn causing the field current to be altered in such a way as to increase the alternator output. So much for the theory and now for the practicalities. Well of course we weren't expected to be able to replace a new big-end in the engine or anything like that. That sort of work would be the province of the MT people, but we had to know how to start the thing and carry out daily routine maintenance. These units were designed to run continuously, so the first requirement was to never let it run out of fuel. If that happened it would not restart until all the air bubbles had been bled out of the fuel feed. That meant unscrewing several unions in turn and checking that clear fuel flowed, a messy and tedious job. However, running out of fuel was considered to be a quite likely problem to be encountered in real life, so after the technique had been demonstrated to us by our civilian instructor, we were all required to bleed a system. Quite naturally, 'Starting Up' was considered to be a pretty important item on the agenda, and we found that a variety of ways had been provided to achieve that necessary condition. First there was the conventional starter motor method. First one had to lift all the exhaust valves and though that sounds very technical, in fact it was very simple. Because of the high compression ratio it was impossible to turn the crankshaft against it. Hence a manual control in the form of an external rod equipped with four cams ran the length of the crankcase and these lifted the four exhaust valves by means of elongated plungers, and this rod could be latched in the lifted position. Then the crankshaft was spun by whatever means and the rod de-latched. The heavy flywheel overcame the compression and with luck at least one cylinder would fire. So the basic method was to lift the valves, press down the starter motor button, and in a few seconds, de-latch the valves. This method worked well if the starter battery was in good shape. Failing that, one could use the hydraulic starter. This method employed a hand operated pump, the handle of which was a lever about four feet high. This had to be rocked back and forth about fifty times whilst watching the slowly climbing needle of a pressure gauge. When that reached the red mark a button could be operated and the high pressure hydraulic oil was released to turn the vanes of a hydraulic starter motor. The effect was exactly the same as using the battery start and it worked very well. The next, rather extreme method for cold climates, was a 'cartridge start' system whereby an injector had to be removed and replaced by an explosive device. Needless to say this method was not for the faint-hearted, and unsurprisingly, but to our discontent, it was not even demonstrated. The final method was to crank the great beast by hand! With the valves latched open as above, a massive two-man starting handle could be engaged with a dog on the external end of the crankshaft. After getting the thing spinning with about ten rotations of united effort, one of the four hands could be spared to de-latch the valves. There would come a cough from the exhaust, a slight hesitation then a roar as it burst into life! We had great fun in attempting to do this alone, and it was just possible, but the trouble was, one did not have a hand to spare for the de-latching. In mid rotation of the handle, it was necessary to raise one foot to hip height and kick the de-latcher. The alternator outputs were connected to suitable loads which consisted of banks of ordinary domestic two-bar electric fires mounted on the wall of the hangar, and of course they glowed red when in use. As you can easily imagine, we had a bit of fun in trying to get them to glow rather brighter, by over-revving the diesels by manual control, and/or tampering with the regulator. Of course this was anathema to our instructor as he feared damage being caused to his engines and he would dash between the three sets remonstrating with the groups of pupils in turn, as first one group then another caused his aggravation. NOTE for those who arrived from El Adem : Eight RAF Locking pages exist in addition to this one and these are available via the index.